I’ve been wondering for some time which number counts at the end of the day: the number at the top of the status bar or the number below at follow limits? I do not reach the desired number of follows on some days. Can it be that because I have set at “follow limits per hour” 5-35 and in some hours the lower end is selected, although above 34.52 follow per hour is? Do you think I’m not reaching the given “follow limit per day” of 500 because I set the “follow limit per hour” at 5-35? I’m thinking about leaving it empty because the run timers above are already set up right. The only thing I want to have a limit per hour is actually because the run timers are random and I dont want an hour with 50+ follows or something like that. I already made a calculation like that. And yes, I want to have the upper limit higher because the run timers are set up very random. Why not set it to 25-30 for one day and see if you hit targets. Then you will know if this is the problem or your searches are taking too long. There’s an option to drop sources that take too long so you could see if this helps too. in addition to @avo you can also activate “send to extracted user” and fill the extraction buffer. Once you have enough in there you can use the extracted followers for direct following. This way you can exclude that missing your target has anything to do with search or filters. Did you put something in that field? Do you think I’m not reaching the given “follow limit per day” of 500 because I set the “follow limit per hour” at 5-35? Well your first issue is right now you’re capped at 375 max per day. That doesn’t take your sleep time or delay between follows into account. If you put it up to 25 minimum/hr now you should hit your current follow limits but you will most likely need to either allow more execution hours, lower the delay between follows or reduce the sleep time to max out at 500 once you get to that point. 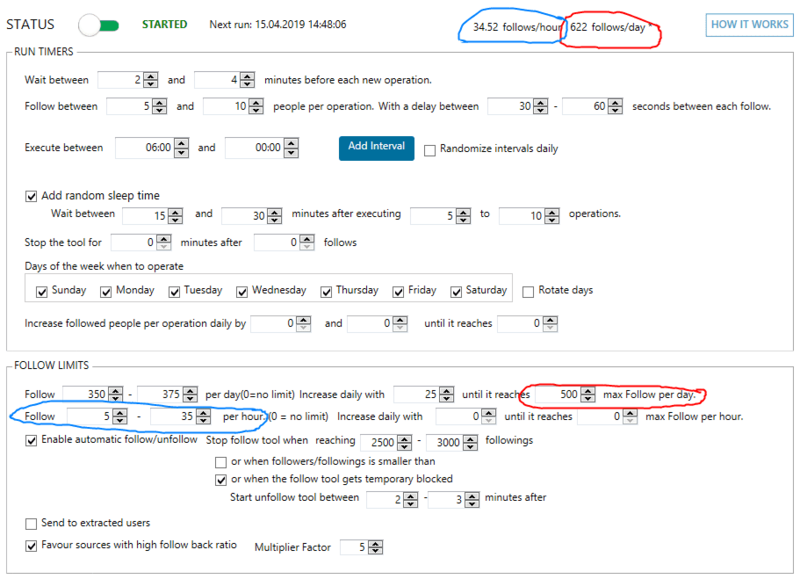 So even if you went with my suggestion of a min 25 following/hr at best you’ll get 382 followings/day with the fastest times always being selected with your RNG.